Villains are an elusive lot, and they can evade you at just the wrong moment—like when you need to put some nefarious miscreant in the way of a team of young superheroes. Not to worry, though! The Deck of Villainy has 54 villains ready to go, each with full-color art by Michael Lee Lunsford, layout by Daniel Solis, and text by Brendan Conway, along with a tuckbox by Sarah Richardson. Each card comes with the villain’s portrait, drive, description, and list of their abilities. It also includes a set of moves and conditions to use during play. 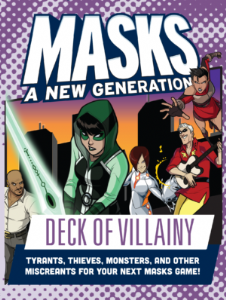 Each villain has everything you need to quickly and easily bring a new nemesis into your game of Masks. Also included is a summary card with the rules for creating your own villains, so you can quickly and easily generate your own addition to this rogue’s gallery on the fly.